There are 37 reviews of Orange Sanguine. Orange Sanguine is more a jasmine and geranium fragrance that covers the citrus opening. There is a little bit of pepper in there and some light woods in the background that give it a more unisex appeal. It's enjoyable as it is and I would recommend this more for people looking for florals like jasmine, lily of the valley, and geranium. The orange is bitter and not that zesty; it doesn't smell particularly like straight orange juice, like many reviewed it and I like that. The heart brings flowers and a bit of sweetness. The blend is creamy, bitter-sweet, orange smelling, but again, not juicy. I suppose that the sandalwood and tonka provide the sweet and creamy aroma. The base is typical Atelier. I think this one is greatly overlooked when it comes to orange scents. To my nose, this is the most accurate blood orange perfume out there. I bought the deluxe mini's at Sephora for maybe $20 dollars and I suggest you do the same if you're a fan of Atelier or orange scents. Got this fragrance in a windfall--super discounted travel set. It hadn't even been on my radar, really; but couldn't pass on such a great deal. My thinking was "what's not to like? Oranges. Fresh. Light." So I spritzed some on. Lovely. Fresh. Light. Very light. Extremely light. It starts with a full-on wave of fresh-cut oranges that smell realistic enough that my mouth almost watered. I didn't detect anything else except the smell of orange rind, actually like the yellowish liquid that shoots out when you twist a piece of orange rind; sharp, almost bitter. I enjoyed it immensely...for the whole hour that it lasted. Next try: layering with all the items included in the travel arsenal. Shower gel and soap followed by body lotion, and then the juice. Same result; bright, cheery, linear orange for a very short period of time. Then...nothing. I will definitely finish what I have, but will have to carry the atomizer with me for frequent touch-ups. The scent is simple and lovely, but gets a thumbs-down from me for its weak performance. No way would I lay out full $ for this one. 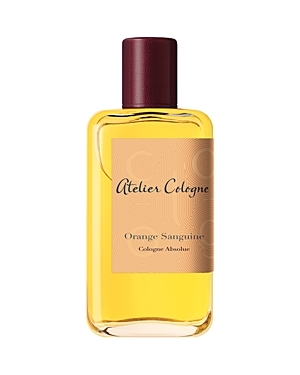 Atelier Cologne Orange Sanguine Cologne Absolue Pure Perfume 3.4 oz. Atelier Cologne Orange Sanguine 15 ml Glass Spray AMAZING ORANGE SCENT GENUINE! There are no member images of Orange Sanguine yet. Why not be the first? Hermes Eau d`Orange Verte and Atelier Cologne Orange Sanguine..differences and similarities?